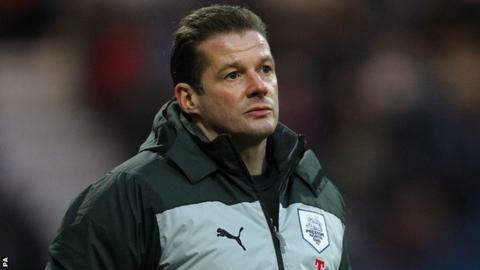 Preston North End have sacked manager Graham Westley after 13 months in charge at Deepdale. The 44-year-old former Stevenage boss's departure follows Tuesday's 3-1 defeat at Yeovil. Westley leaves the Lilywhites just five points above the League One relegation zone, with only one win in the competition since November. "The board felt that a change of manager was the only way forward," a statement on the club website read. After the loss at Huish Park, Westley insisted that he would not walk away from his position. "When things aren't working, it's my responsibility to do all I can to right them," he told BBC Radio Lancashire on Tuesday. "I'm working in difficult circumstances with injuries. You've never seen me walk away from anything in my life, so don't expect me to [resign]." Westley, who has spent most of his playing and managerial career in non-league, rose to prominence when he guided Stevenage into the Football League for the first time in the club's history, before taking them into League One at the first attempt. He left Stevenage to take over at Preston in January 2012, and after guiding his new club to a 15th-placed finish in the league last season, Westley carried out an overhaul of the squad during the summer. From last term's side, only goalkeeper Thorsten Stuckmann, defender Bailey Wright and winger Will Hayhurst remained at Deepdale as he replaced almost the entire squad. Preston began the season solidly, but injuries to key players Keith Keane and Scott Laird meant their form stuttered and helped contribute to Westley's departure. His exit means this is the fourth successive season that Preston have had a managerial change, after Alan Irvine, Darren Ferguson and Phil Brown were sacked from the post in 2009, 2010 and 2011 respectively. The club have confirmed that they will announce who will take charge on caretaker basis on Thursday.